← What is Traditional Music? In the medieval era, there were the troubadours who traveled the country performing songs they had composed. Nowadays, that’s the life of the folk singer/songwriter. Woody Guthrie was one of the earliest in the modern era to write songs about social issues, current events, or just everyday life. “I look through your eyes to see the hill you’re standing on,” he wrote. “My job is to tell you something you already know.” He then inspired musicians in the ‘60s folk revival such as Bob Dylan and Tom Paxton. So what compels musicians to become songwriters? For some, it’s a way to express themselves, put their poetry to music, or talk about what’s going on in their lives. 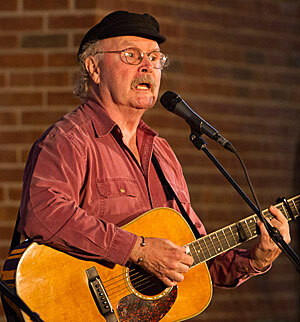 For others, it might be a chance to tell a story or to develop a certain character (see this video of Tom Paxton’s “My Pony Knows the Way” for an example). If you want to know more about modern-day songwriters, come to the weekly singaround at the Golden Link Folk Singing Society (Tuesdays 7:30-10 pm, 12 Corners Presbyterian Church). Local musicians regularly attend and perform the songs they have written. Or you can attend one of Golden Link’s monthly concerts featuring touring musicians. Visit www.goldenlink.org for more information. This story was also published on the Golden Link Folk Singing Society’s blog as part of the Arts Community page of the Democrat and Chronicle web site. Click here to view the Golden Link blog page. This entry was posted in Synchronicity: Musings on Words, Music, and the Arts and tagged folk music, Golden Link, Paul McCatrney, songs, songwriting, Tom Paxton, Woody Guthrie. Bookmark the permalink. 1 Response to Why Do Musicians Write Songs?